The Doctor has been disposed of, and the end of the universe is nigh. There will only be one winner, but how many will lose? The Doctor, Liv and Helen are hurtling into a future that has been utterly destroyed, trapped inside a shuttle with no possible means of escape. But with the lives of everyone in the universe in the balance, they've got to find one. And soon. When the stakes are this high, you can't just give up. Or can you? Left to fend for herself against a bunch of power-hungry plotters hell-bent on destroying the universe, what choice does a girl have but to throw in her lot with the winning side? Using her past to her advantage, River Song returns to the ancestral seat of the Time Lords to make her last stand. Cardinal Ollistra has plans for New York, plans which involve the Deputy Mayor and her sponsor, one ‘Reverend Mortimer’ – better known to the Doctor as the Meddling Monk. The Eleven arrives to stamp out the resistance, but that isn't the only danger the Doctor finds lurking in the shadows – for New York is a city of Weeping Angels. The time has arrived. Events are in motion. The end of the universe is at hand and the Doctor and his friends have one hour to save eternity. Starting now. 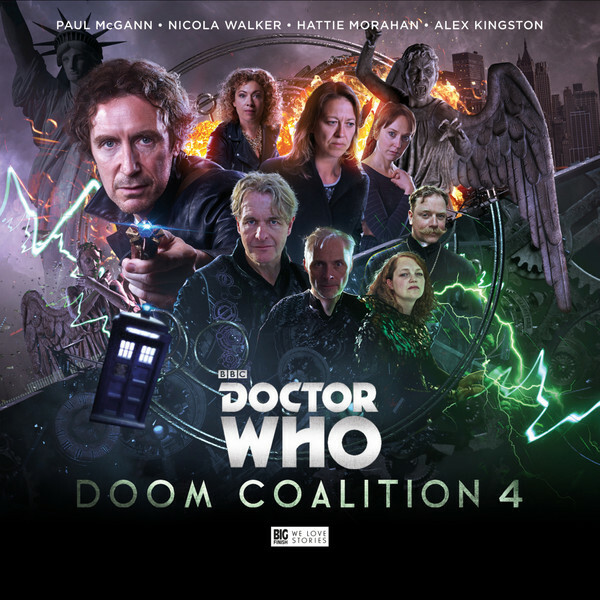 Paul McGann (The Doctor), Nicola Walker (Liv Chenka), Hattie Morahan (Helen Sinclair), Alex Kingston (River Song), Mark Bonnar (The Eleven), Robert Bathurst (Padrac), Emma Cunniffe (The Sonomancer), Rufus Hound (The Meddling Monk), Beth Chalmers (Veklin), Carolyn Pickles (Cardinal Ollistra), Jacqueline Pearce (Ollistra), Olivia Poulet (Jerasta), Vince Leigh (Volstrom/ Matrix Keeper/ Computer), Sasha Behar (Presidential Aide/ Tessno/ Ladonne), Ronnie Ancona (Joanie Carrington), Alex Beckett (Alekall). Other parts played by members of the cast.